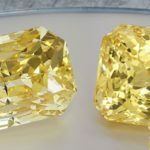 What Is The Best Shape (Cut) For Yellow Sapphire? Sapphires are beautiful gemstones that are not only amazingly stunning but also equally beneficial for the wearers. While there are many alluring colors available in the world of sapphires, more often than not, a mention of the word ‘sapphire’ makes one think of the exotic ‘blue sapphire’. However, not just blue, there is a wide variety of colors that are in huge demand amongst the sapphire lovers and “Yellow Sapphires” is one such color. A well-cut yellow sapphire is a proud possession, and people from all walks of life wish to have such a possession. Such a sapphire displays the vividness of its yellow hue in the best possible manner, bringing great luster and exquisiteness. 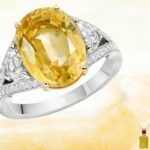 Yellow sapphire gemstone usually gets a deeper cut to get the dimension and intensity needed to bring out the true tone of the yellow sapphire gemstone. 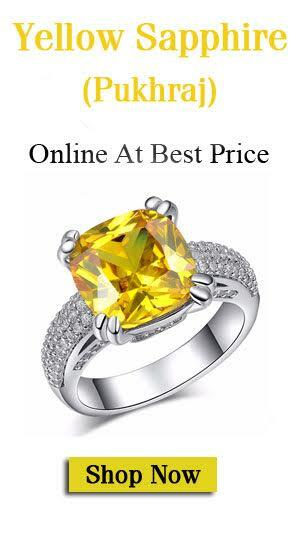 Here I am going to tell you some of the terms which are often used in the description of the yellow sapphire gemstone. Hue refers to the yellow sapphire’s basic color – light yellow, golden yellow, dark yellow. It is also known as color purity and intensity. It is described as the extent to which the hue is masked by brown or gray. It refers to the quantity of color in the sapphire that ranges from very light to very dark. How is Yellow Sapphire Measured? Precious gemstones vary in density. When we compare a diamond and a sapphire of the same size, then the sapphire will be heavier due to its larger density. Gemstones are frequently grouped via carats, which is a unit of weight, however, for simplicity of choice and setting, size is a more valuable estimation for sapphires, which we list in millimeters (mm). Our standard size for around sapphire is 6 mm, which is roughly one carat. The cuts from one of the key components of the famous yellow sapphire 4C’s: color, clarity, cut and carat. No matter what type of cut is given to a sapphire, it should have symmetrical and even edges. One of the best cuts considered for the yellow sapphire gems, the Princess Cut gives a square shape to the gemstone which enhances its polishing and makes it look absolutely attractive. The highly popular Cushion Cut is also called the pillow cut. While initially created to give diamonds a great look, this type of cut gives the gemstone a good window with rounded corners. An emerald-cut sapphire has sloping four-sided facets which are given in a rectangular shape to create a beautiful optical appearance and to highlight the clarity of the gemstone. A cut that’s much in demand for ages now, the Round Brilliant Cut is given to make a sapphire balance its color and clarity, getting the much-needed brilliance and splendor. The Heart Shaped Cut, as the name suggests, is a timeless classic cut that is preferred by all those gem fanatics who wish to gift a gem jewel to their loved ones. This cut that comes with a single point and a rounded end is also known as a teardrop and gives a stunning pear style shape to the gemstone, accentuating its prettiness even more. This cut is also famous for providing a certain slimming effect to the fingers of the yellow sapphire ring wearer. The Square Emerald Cut gives a yellow sapphire a look that is quite similar to that of an emerald. As a matter of fact, this cut is pretty much identical to the emerald cut, barring the fact that it is in a square shape, as evident from the name. This cut is quite similar to the round cut but gives an incredible brilliance to the gemstone. An Oval Cut is usually preferred by many as this type of cut can add more charm to the beauty of long and slender fingers.